Following on from 10000 all electric miles, today I hit the next milestone of 20000 miles completed in just over 16 months since delivery. A major chunk of this second 10000 miles was the European road trip I did with my family over August which was 3,333 miles of pure Supercharger mileage. As expected this second stint has been flawless. I’ve taken to taking more detailed records of when and how much I charge at home, therefore how much I spend on ‘fuelling’ the Tesla, than I did for the first 10000 miles. 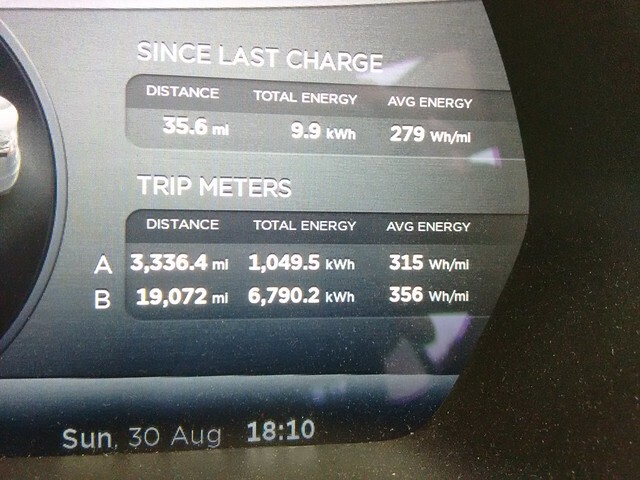 So miles 10000 to 15000 took 618KWh of charging from home and during that time my rate was 11.4p/KWh giving a total of £70.45. On top of this I needed to charge while I was in Berlin for a weekend and there was a charge point right across the road from my hotel so really didn’t mind paying to use this and filled the battery up from the 22KW charge point landing me a bill for £17.25. So that 5000 mile stint in total cost £87.70. Miles 15000 to 20000 needed 325KWh of charging but I’d changed suppliers and my rate had increased to 12.91p/KWh giving a total of £41.96 for this stint. Adding them together gives a total cost of £129.66 to drive 10000 miles or 1.3p per mile. And adding this to the first 10000 miles’ total of £250.34 gives an incredibly round figure of £380 exactly or 1.6p per mile over the first 20000 miles I’ve owned the Tesla. So that’s the purely financial overview not going into the amount of fossil fuel that has not been used with all that implies. 7 months after taking ownership of our Tesla Model S, we have just crossed the 10000 mile threshold and thought it would be a good point to reflect on what impact if any, this decision has had. Firstly I will compare how the Model S stacks up against my previous car, a VW Passat and a car of equivalent value to the Model S.
10000 miles @ 47mpg = 212.77 gallons = 967.25 litres of diesel. The price of diesel has dropped dramatically over the last 7 months so to be completely unfair to the Tesla I’m going to pretend all of the diesel was bought at todays price of 114.9p/litre making a total cost of £1111.47 to do that 10000 miles. Next let’s see how this stacks up if I had charged 100% at home, again to put the Tesla in the worst possible light. This time the calculation is a little easier. Making a straight saving of £729.31 per 10000 miles. Now in the real world I do a lot of charging whilst out and about. I have a supercharger on route to the current client I am servicing and they also have 3 charge points at the office itself! (albeit very slow ones) There are also the Ecotricity points at the vast majority of motorway service stations. There are also charge points dotted around Coventry city centre that I make use of whilst out shopping. Upon taking delivery of the Model S, Chargemaster took quite a while before installing my home charge point, by which time I’d already clocked up 3000 miles all at zero cost. Since that point well over half of my milage has been using externally acquired juice. For simplicity, lets say it’s exactly half making 65% of the 10000 miles costing nothing at all. This means that the real world cost of my first 10000 miles in the Model S is about £250.34 or 2.5p/mile. I can hear the ‘Yes but that electricity all comes from coal’ arguments already. At home I pay extra for a 100% renewable energy tariff. Tesla are dedicated to using renewable energy wherever possible. Ecotricity are known for their wind power initiatives. I cannot vouch for the energy mix from the office charge points so cannot say if the co2 levels are good, bad or ugly. The Passat on the other hand is rated at 158g/km or in old money, 254.2g/mile making a total co2 (not) output of 254.2KG. Lets call it a quarter of a ton per 10000 miles between friends. I have no idea if that is a lot or an insignificant amount as I have no scale to measure this amount against. If you are developing for a client that requires webforms or CRM software then the Vtiger plugin would be most suitable. Everything you need to know about how to get proper typography onto your sites today. Here at Nearlydone, we use and recommend a variety of different plugins to help improve website functionality. By visiting WordPress.org, or your website admin plugin area, you will come across downloads, documentation and reviews to help you decide which plugins, out of a wide selection, is most suitable for you.